Another New Scientist assignment, interviewing artist duo Semiconductor, who turn the most abstruse scientific observations into captivating sensory experiences. RUTH JARMAN: Since we first started making work we’ve been interested in nature and matter. We went looking for matter that exists beyond the bounds of our perception, and we turned to science as a means of bringing that matter into view. We’re not led by archives or data sets. We’re interested in the way people talk about their field, and how they use language to balance their observations and their experiments. For some fields – radio astronomy springs to mind – the observable bit of the work can only be considered information: as a bit of the natural world, it’s just chaos: pure white noise. Whenever we work with scientific data, we ask how we can best perceive it. About fifteen years ago we made a film of the sun, using data being studied at the space sciences laboratory at the University of California at Berkeley. That work was relatively unproblematic: the sun is unquestionably there for you to observe. With our installation HALO, though, we’re creating an immersive environment that enriches the data captured by Atlas, one of two general-purpose detectors at the Large Hadron Collider at CERN. And Atlas detects collisions that actually don’t happen unless you force them! In the early universe, there would have been the energies and speeds for proton-proton collisions like this to have shaped the early universe. That’s no longer true. We found ourselves making a piece of work that isn’t really about nature as it exists at the moment. It was departure for us and, a troubling one at first. 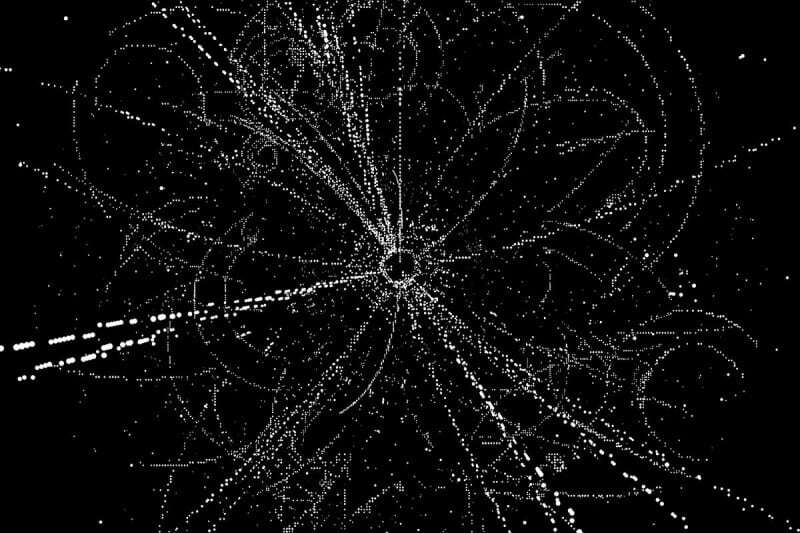 JOE GERHARDT: Proton-proton collisions take place inside the Atlas millions of times a second, Of those events, just a few thousand are considered worth mining for data. The proton-proton collisions are recorded by detectors wrapped around the barrel of the instrument. Beyond them are the transition radiation trackers – long wires that register whenever a particle collides with them. Where along the wire the collision happens is not recorded, but you can say the collision happened somewhere along its length. Rows and rows of long metal wires: we imagined something a bit like a giant harp being plucked. JARMAN: Initially we interpreted the wires as a purely sculptural device. We wanted to convey the craft and know-how that went into the Atlas machinery, without simply illustrating what was already there. After endless iterations it became obvious that these wires were there to be played. For the people at CERN, the events recorded by the Atlas are sources of information. We on the other hand treat those collisions as natural phenomena in their own right. In our installation you’re conscious of the surrounding technology, but at the same time you’re made aware that there’s a complex natural world beyond the machinery. The soundscapes generated by HALO represent that wider world. GERHARDT: The scientists at CERN call the raw numbers they receive from the Atlas “minimum bias data”. I love that. We tend to assume science is all about looking at the world with the least bias possible, but of course when you’re experimenting, you’re doing exactly the opposite. You want to bring the maximum amount of bias possible to an experiment so you can focus on what interests you. That’s what an hypothesis is. JARMAN: We’ve plucked 60 collision events from the millions that occur each second in the LHC, and use them to trigger HALO’s light and sound effects. To do that, of course, we’ve had to slow them down immeasurably so as to make them comprehensible. Once you reanimate the data in this way, you can start tracing the beautiful geometries of each collision. And as one of our chief collaborators pointed out early on, this is the very material CERN’s not interested in. GERHARDT: The interesting stuff for us is usually the stuff the scientists discard. Mark Sutton, a research fellow at Sussex University, explained to us that any particle that makes a pretty, spiralling track back towards the centre of the detector lacks the energy to escape the machine’s magnetic field. We know all about those particles. It’s the absences, the unexplained gaps in the chart that matter to the scientists. When the hammers that “play” HALO hit certain strings, resonators pass and amplify their vibrations to neighbouring strings, until the wires become visible waveforms. Meanwhile, we’ve got spots of light being projection-mapped through the mesh surrounding the installation. We wanted a way of feeling and seeing particles and waves simultaneously, and this “quantum” way of thinking is oddly easy to do once you start thinking about harmonics. Particles and waves begin to make sense as one thing. JARMAN: When HALO opens at the Art Basel this week, there will be information boards explaining all the science and technology we’ve drawn from. Ideally you’ll through the installation twice – once naively, and the second time armed with some background information. Of course, the test of the piece is that first, direct engagement with the piece. That’s what matters most to us. GERHARDT: HALO is a circular installation in a space big enough that you can approach it from a distance and observe the hammers striking its strings and the lights passing through its mesh. Once you’re inside the piece, then it will appear that you are the source of all the events that are animating it. It’ll be a much more intense, immersive experience. It occurred to us recently that it’ll be like inhabiting the workings of a watch: appropriate for a piece paid for by a Swiss watchmaker. JARMAN: The fit wasn’t conscious, but it’s undeniably there. We were invited to look around the factory of Audemars Piguet, our sponsors and long-time associate partners of Art Basel, where HALO has its first outing this week. We saw watches being assembled by hand using screws that you can’t even see properly with the naked eye. My favourite was a watch that actually chimed; someone had made it a lovely little acoustic box to amplify the sound. GERHARDT: Our visit reminded us that there’s bespoke side to CERN that we wanted to capture. Big as it is, nothing about the LHC is run off on an assembly line. It’s crafted and shaped. It’s an artisanal object. JARMAN: Entering any big science institution, you find yourself playing anthropologist. So much of our work involves simply observing scientists at work in their domain. A film we made as part of our residency, The View from Nowhere, reflects this. GERHARDT: Unpicking the hierarchies in these places is endlessly fascinating. At CERN there’s a big philosophical divide between the experimenters and the theorists. The theorists always think they are the top dogs because they get to decide which experiments are even worth doing! JARMAN: At CERN everything is so much more lo-fi then you expect it to be, and perfectly accessible on a human level. You get a powerful sense of everything having been developed in this wonderful bubble in which nobody has had to make excuses for doing their work. There’s a wonderful honesty about the place. GERHARDT: As an artist in an environment like that, staying naive is really important. The moment you think that “you know your field”, you stop really listening. And besides, every institution is different. Our residency at the Smithsonian in 2010 was very much about archiving geological history, about finding a place for everything. And the Galapagos residency which followed was about removing human traces from the world and turning back time. GERHARDT: In any scientific institution, people just want to make sure that you’re not getting their budget. As long as their science budgets aren’t going to artists, as long as that money’s coming from somewhere else, people are happy. Of course, if the arts budget was just 1 per cent of the science budget, the arts would probably be a hundred times better off. JARMAN: Every now and then we’ll come across a scientist who will say, “Oh, so will I be able to use your work to illustrate my work?” We’re up front about this: what we do is almost certainly not going to represent anyone else’s efforts in the way they want. Saying that, the feedback that we do get from scientists has always been amazing. At the end of our Berkeley residency, working with images of the sun, we were able to show our hosts work assembled from thousands of their images. These people would study just a single image for a very long time, and there was this real appetite to have their work presented in a new way. It was then we realised we were fulfilling this other role: reminding these people why they do what they do.